Note: Although the episode after “Extremis” has already aired at the time of posting this review, at the time of writing, I have not yet watched “The Pyramid at the End of the World”. This review is written without knowledge of what comes next. I mentioned in my review of the previous episode, “Oxygen”, that I’ve found Series 10 to be the most consistently good series of Doctor Who in a long time. This opinion has definitely not changed. However, one of the things I’ve particularly liked about the earlier episodes of the series is that they have stopped focusing heavily on the show’s past and instead have started looking forward to new ideas and new journeys. In “Extremis”, the show does start looking to the past again. This isn’t necessarily a bad thing, and in fact, Doctor Who should never completely disregard its past; looking to the past ought to happen from time to time. “Extremis” handles this very well. Its use of the past helps to build its future. However, “Extremis” is also a somewhat less accessible episode to newer viewers than the previous five have been. Considering that this series has been deliberately structured to be an ideal “jumping-on” point for new viewers, I do wonder if “Extremis” might be a bit of a misstep—not a big one, but a little one. It will depend a lot on what happens in future episodes. Whether it is or not, “Extremis” is still an excellent episode that I enjoy immensely. It has a wonderfully foreboding atmosphere, and introduces a creepy new set of monstrous aliens. It has a more complex plot than the previous episodes of the series, but everything ties together well and events are fully understandable by the end. There are also some interesting developments in the series’ arc. Overall, “Extremis” continues the high quality of Series 10 so far. 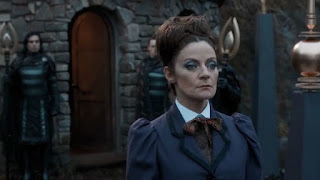 Missy is the major element of Doctor Who’s past in “Extremis”, but it’s not the one that I feel makes it a little less accessible to newer viewers. Rather, it’s the references to River Song. Without actually ever being named in the episode, she has a very strong presence. Of course, River had a very strong impact on the Doctor’s life and the Doctor should certainly never forget her, so I don’t consider this a major issue. As I said, it might be a small misstep, but not a big one. On initial viewing, I was a bit surprised that “Extremis” reveals the occupant of the mysterious vault. Considering that the series is only barely half-way done, I wasn’t expecting this so soon. That said, Missy was the obvious choice and dragging out the question for the whole series could have resulted in people losing interest, so the revelation here is a wise choice, and it allows the story to then develop the reasons behind what is going on. And the revelation doesn’t answer all the questions and even creates new ones. Why is the vault in a university on Earth instead of inside the TARDIS or some other much more isolated location? Why is it so important that the Doctor not leave Earth? Previous episodes have indicated that the Doctor’s vow includes not having any more companions and not leaving Earth, yet the vow he makes in “Extremis” does not specify those things at all. So revealing that the vault’s occupant is Missy still leaves much for the arc story to do. Yet I will confess to a worry: Some of these questions will not be answered, or their answers won’t quite fit with what has happened at the beginning of the series. As such, I do worry a bit that the resolution to the series arc is going to be a bit of a disappointment. Of course, I hope I’m wrong, and even if I’m not, I’m still confident there will enough other good things going on in the series that it won’t be that much of an issue. Regardless of where the story arc goes from here, how it plays out in “Extremis” is very good. I particularly like how the episode’s two story-lines (the Veritas story and the Missy execution story) come together after seemingly having little, if anything, to do with one another. 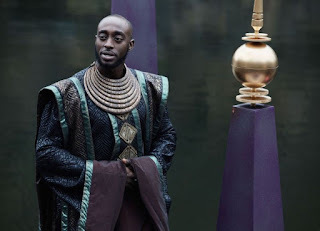 The Missy story is actually very predictable and by itself would not make for a very interesting episode, but what makes it work is its development of Missy (we see a much more reserved side to her) and more importantly, its effect on the Doctor, which in turn gives him the strength to still be the Doctor even after finding out that he’s not the “real” Doctor. A great performance from Michelle Gomez also plays a large role in making this story-line work. 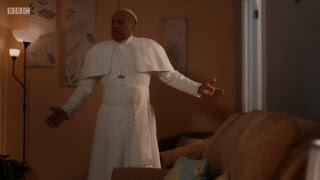 In addition, the Missy story-line is an effective contrast to the rest of the episode playing out in the Vatican. Its straight-forward, predictable simplicity contrasts with the denser mystery and revelations of the whole Veritas. Even the villains of each story are huge contrasts of each other. The executioners (who aren’t necessarily strictly villains, but the Doctor treats them as such by the end) are very straight-forward about what they are doing. There is no mystery about them. They are also perhaps the politest executioners you are ever likely to encounter. 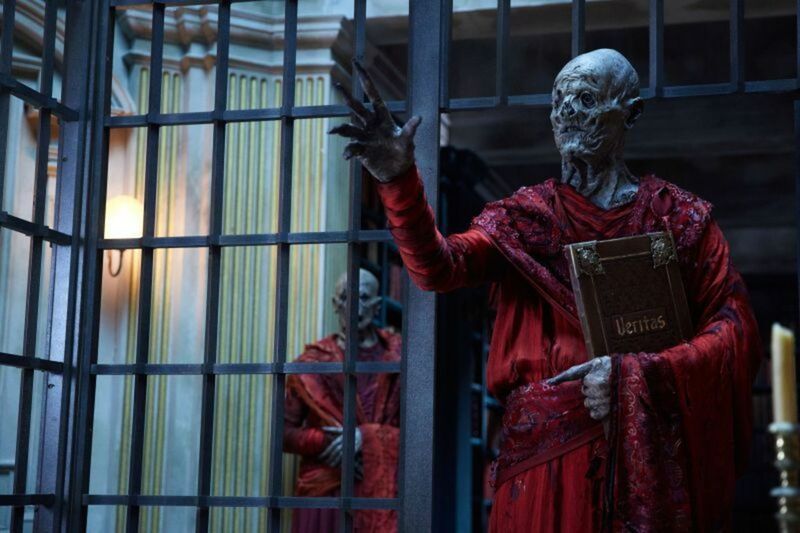 The monks, on the other hand, move in the shadows behind the scenes, and they are much more classically monstrous. There’s no politeness to what they do. 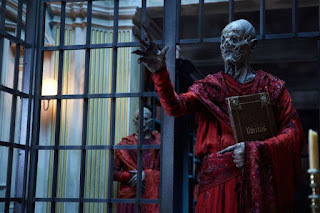 Through the contrasting villains, “Extremis” plays around with something that has become a bit of an annoying trope in Doctor Who in recent years: enemies running away from the Doctor just because he’s the Doctor, even though they actually have the upper hand (“The Pandorica Opens”/“The Big Bang” has one of the most egregious examples of this). Missy’s executioners run from the Doctor once they learn who he is, even though he’s unarmed and can’t really do anything to stop them. Yet what makes it work here is its contrast to the reaction the monks have to the Doctor. They know who the Doctor is, but they don’t run. Instead, they proceed to tell him that they have defeated him (presumably via their simulations) many times before. In this way, Moffat uses the idea that the monsters are usually supposed to be afraid of the Doctor to create greater menace with monsters that aren’t afraid of the Doctor. And then the Doctor finds a way to outsmart them anyway. It makes for a thrilling resolution. I may have criticism of how Steven Moffat resolves ongoing plots, but he can be very good at resolving single-episode plots (and yes, this episode is just the first part of a three-part story, but the simulation side of the story is resolved—or certainly appears to be, at any rate). It’s also great that, even though he’s not the “real” Doctor, he’s still the Doctor—the idea that it’s your actions that make you the Doctor, not the physical or simulated body you happen to possess. You don’t have to be real to be the Doctor, as long as you never give up, as long as you always trick the bad guys into their own traps. And here’s the trap you fell into: Your simulation is far too good. It’s a pretty tried-and-true story-telling trope—the villains are beaten by their own hubris—but it works. Of course, one could get into minutiae about why the monks’ program doesn’t have safeguards against this kind of thing or, given that they can create sentient simulations capable of all kinds of different decisions, why they can’t manage to have multiple random number generators running. But that kind of misses the point. The monks are not perfect. They’ve made mistakes and the Doctor uses those mistakes against them. I’m not entirely convinced that everyone who reads the Veritas would actually decide to kill themselves. Many would, yes, either for the reason that it will disrupt the plans of the monks or simply out of despair. But I would also expect that some people would be too frightened to take that option and that others may search for other solutions (like the Doctor ultimately does). However, including all of that would have created a very different story with less of a mystery to it, so it’s not an issue to me. And it does allow the mass suicide of the CERN scientists to be one of the most disturbing scenes ever on Doctor Who. It’s extremely well played (even if the sticks of dynamite are a bit over-the-top) and I found it wonderfully chilling. Though I do wonder if the inclusion of so much suicide is straddling the line of what is acceptable in a show watched by so many children. Suicide as a way to fix problems is not the best of messages (I’ve commented on that before). There are a lot great moments in “Extremis”, in particular the interactions between the main cast. 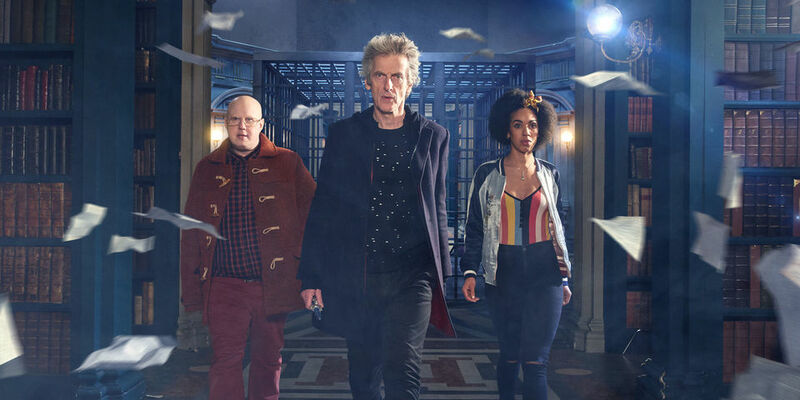 I like that Bill and Nardole spend a lot of time together. They haven’t had much interaction with each other in previous episodes and pretty much none without the Doctor around, so this is a good opportunity to develop their relationship. The Pope’s arrival during Bill’s date is absolutely hilarious, and is a great example of how Doctor Who can mix humour into otherwise sinister and ominous episodes. At the same time, Bill’s date with another black woman is an important moment for television in general. Two black women on a date together is a rare sight on television, making this an important moment of representation. I also like that Bill’s foster mother, Moira, makes a reappearance this episode, and there’s a mention of Bill briefly moving out. It helps keep the continuity consistent—something I was a bit worried about previously (see my review of “Knock Knock”). The Doctor’s blindness is handled well, too. He makes use of technology for partial solutions, but it’s nice to see it not just hand-waved away with an instant, easy solution. It maintains consequence for the Doctor’s actions last episode, and I can never repeat too many times how much I like seeing actual consequences in Doctor Who. Finally, the episode has a very effective atmosphere, with good use of lighting and blurred point-of-view shots for the Doctor’s partial vision. There’s a very ominous feel to the whole thing. That said, however, there are some very odd scene cuts, including one instance of an abrupt fade to black during the Missy story-line that then leaves the screen black for a strangely long time before returning to the Vatican. The moments are jarring in an otherwise very well directed episode. Overall, there’s a lot to like about “Extremis”. It’s a great introduction to the mysterious monks and I look forward to seeing their plans unfold over the next couple episodes. All the seasons of doctor who are amazing, but in my opinion season 10 is beyond fascinating. This review wants me to watch this episode all over again.